Do photojournalists count as passengers or crew? Do you need to maintain takeoff/landing currency to fly with them? You need to maintain recent flight experience regardless of the titles of the folks sitting in the cabin. Unless you’re operating a machine which requires 2 people to fly it i.e. –copilot or an additional pilot required by the operation (IFR or NVG), you must be current to carry anyone. Edited by Spike, 07 June 2014 - 10:56. "(1) Except as provided in paragraph (e) of this section, no person may act as pilot in command of an aircraft carrying passengers during the period beginning 1 hour after sunset and ending 1 hour before sunrise, unless within the preceding 90 days that person has made at least three takeoffs and three landings to a full stop during the period beginning 1 hour after sunset and ending 1 hour before sunrise"
I'm just asking if the FAA would define them as a passenger or not. If people in the cabin are not passengers, then it doesn't apply. If the guy sitting next to you is not a CFI giving you instruction he's a passenger, so make sure you're current. Excellent, thank you Astro. Do they actually provide any list of how they define things anywhere? Edited by Spike, 07 June 2014 - 16:25. Technically, they ARE crewmembers. And by definition, crewmembers are not passengers. But the FAA doesn't always do things the same way as others, so that's why I ask. The letter of the law says that the currency requirements only apply to passengers....I don't carry any passengers. Sadly the regs like many other things in life are designed by people who don't think like the average Joe. My new "smart" phone for instance is so user-unfriendly its rediculous! Here's a question I thought up as I was re-reading this reg. It says you can do the takeoffs/landings in a simulator to get current. SFAR 73 states that the currency must be in the appropriate Robbie. So, if you need to get current in the R44 can you do it in a simulator that is set up like an R44? It depends on how your ENG operation is setup. A "crewmember" is defined as a person assigned to duty during flight time, CFR §1.1. Under CFR §135.85, any crewmember or other employee of the certificate holder may be carried on board without complying with the passenger-carrying requirements of part 135. To codify the fact that the person, designated as a crewmember, is preforming a pre-assigned duty, the operator documents the crewmember's duties and responsibilities and includes them in the air carrier's general operations manual. It need only be a couple of paragraph for each person preforming duties with respect to the ENG operation. The term crewmember is often used interchangeably with flight crewmember. Flight crewmembers are crewmembers accomplishing safety-sensitive functions in flight. However, in this case, the photojournalist is a crewmember accomplishing non-safety-sensitive functions related to the ENG flight operation. Crewmember duties can be safety-sensitive function or non- safety-sensitive functions. Notwithstanding, flight crewmember duties are considered safety-sensitive functions. § 1.1 Flightcrew member - means a pilot, flight engineer, or flight navigator assigned to duty in an aircraft during flight time. Crewmember - means a person assigned to perform duty in an aircraft during flight time. (e) Exceptions. 3) This section does not apply to a pilot in command who is employed by a part 119 certificate holder authorized to conduct operations under part 135 when the pilot is engaged in a flight operation under parts 91 and 135 for that certificate holder if the pilot in command is in compliance with §135.243 and §135.247 of this chapter. In so far as the ENG operation is not engaged in a “Passenger-carrying operations” as defined under §110.2, those parts of §135.243 and §135.247 related to Passenger-carrying operations do not apply. 14 CFR §110.2 - Passenger-carrying operation means any aircraft operation carrying any person, unless the only persons on the aircraft are those identified in §§121.583(a) or 135.85 of this chapter, as applicable. An aircraft used in a passenger-carrying operation may also carry cargo or mail in addition to passengers. Edited by iChris, 27 January 2018 - 14:49. Over the years, I’ve ran into plenty of folks who believe they can simply “designate” a person as a “crewmember” to skirt the rules. Conversely, I’ve met very few folks in the 135 community who do not understand the definition of “crewmember” to include duties and responsibilities, and thus my reply….. It would take less time to just do three takeoffs and landings then read through all this! What qualifies as a take off when it comes to helicopters? Can you go to a hover, fly forward 10ft, land and call that one evolution? Where does it say you must fly a pattern? Ask the guy who signs your paycheck. "In regards to the phrase “. . . three takeoffs and three landings . . . .” with respect to helicopters or any other aircraft category, class, and type, the intent of § 61.57[a] and [b] requires a flight in the traffic pattern between the takeoff phase of flight and landing phrase of flight." "Therefore, lifting off the ground from a position of rest to a hover and returning to a position of rest on the ground five feet away from the point of liftoff, would not meet the intent of 14 CFR § 61.57[a] and [b]. Nor would a series of three liftoffs and set downs to and from a hover to the same point on the ground, meet the intent of 14 CFR § 61.57[a] and [b]." It was a pleasure talking to you on the phone today. After you provided additional information, I was able to find the response to your inquiry. I apologize for the delay. regards to the definition of the terms “takeoff” and “landing” with respect to helicopters. Would lifting off the ground from a position of rest to a hover and returning to a position of rest on the ground, five feet away from the point of liftoff, be considered one  takeoff and one  landing toward the requirements of 14 CFR § 61.57[a] and [b]? Moreover, would a series of three liftoffs and set-downs, to and from a hover, to the same point on the ground meet the requirements of 14 CFR § 61.57[a] and [b]? Attached is the supposed copy of a September 1990 letter of interpretation that addresses “takeoff” and “landing.” However, I cannot find such a letter on your website or verify its authenticity. Is this a true copy? If so, were can it be found on your website. ANSWER: Ref. § 61.57[a] and [b]; In your letter you requested a legal interpretation of 14 CFR § 61.57[a] and [b] in regards to the definition of the terms “takeoff” and “landing” with respect to helicopters. It was decided your question was more a Flight Standards Service policy issue rather than justifying a legal interpretation. In regards to the phrase “. . . three takeoffs and three landings . . . .” with respect to helicopters or any other aircraft category, class, and type, the intent of § 61.57[a] and [b] requires a flight in the traffic pattern between the takeoff phase of flight and landing phrase of flight. [iii] Three takeoffs and three landings to a full stop [with each landing involving a flight in the traffic pattern] at an airport with an operating control tower. The purpose for the takeoff and landing recent flight experience requirements in § 61.57[a] and [b] is for pilots to maintain their takeoff and landing skills. Lifting up and setting back down does not meet the intent of “. . . three takeoffs and three landings . . . .” of § 61.57[a] and [b]. In reviewing the FAA’s Rotorcraft Flying Handbook, FAA H 8083 21, it describes a takeoff as “an orderly transition to forward flight and is executed to increase altitude safely and expeditiously.” Even Figure 9 8 shows a depiction of a takeoff that involves forward flight and climbing to altitude. Whereas, a landing is described and depicted in Figures 9 18 and 9 19 as showing a traffic pattern phrase of flight. Therefore, lifting off the ground from a position of rest to a hover and returning to a position of rest on the ground five feet away from the point of liftoff, would not meet the intent of 14 CFR § 61.57[a] and [b]. Nor would a series of three liftoffs and set downs to and from a hover to the same point on the ground, meet the intent of 14 CFR § 61.57[a] and [b]. 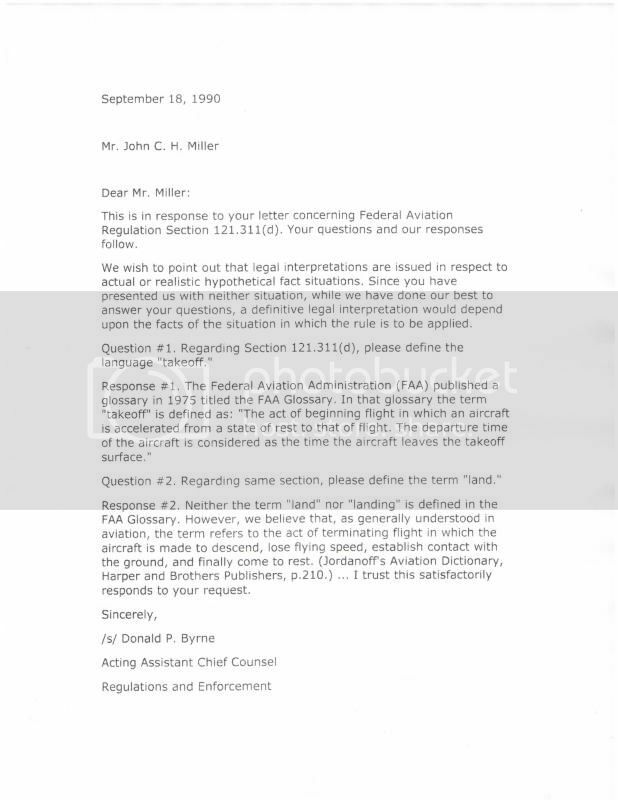 The letter of interpretation that you referred to in your letter that was signed by Mr Donald P. Byrne, Acting Chief Counsel, was an FAA legal interpretation that was published in the Federal Aviation Decisions as Interpretation No. 1990-26. Edited by iChris, 01 March 2015 - 13:17. Aviation regs are much like case law in the legal system. Where there is confusion or lack of clarity in a law, courts have established precedence with case law and court decisions. Thats where many people get themselves into trouble. They will read the reg and say "nothing says I have to fly a full traffic pattern" but they fail to research legal precedence establishing the standard. I see it continually in police work. Someone will rattle off a law to make a point (wrong point) but still.... and my response is generally "So I take it you arent familiar with the recent supreme court decision regarding that issue?" Just had one last night as a matter of fact. Funny and sad at the same time. In most cases the answer is actually out there an accessible. Because someone chooses to stop at the point that suits them doesn't alleviate their responsibility to continue digging for the answer.